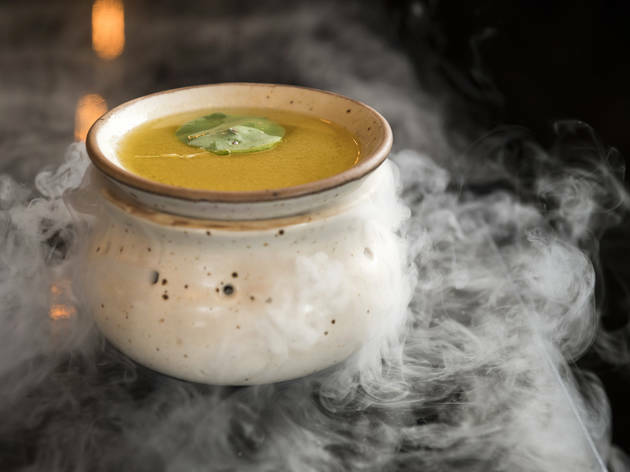 It’s not all smoke and mirrors at this theatrical Indian bar and restaurant (even though there’s a heck of a lot of smoke and fire fanning from the dishes and drinks). 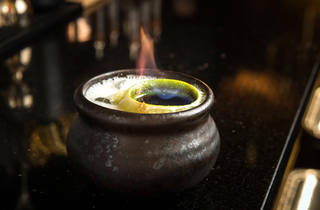 Smoldering cocktails, flaming shots and thick cauldron cups are delivered from behind the bar for visual delight, but the wizardry isn’t simply for show: The drinks taste as beguiling as they look. 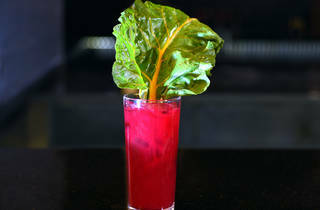 And based on the sophisticated crowd populating the tables at 10pm on a recent Wednesday night, it’s clear the cocktail den from chef-owner Gaurav Anand (Bhatti Indian Grill, Awadh) and partner Monica Saxena has some neighborhood buzz. 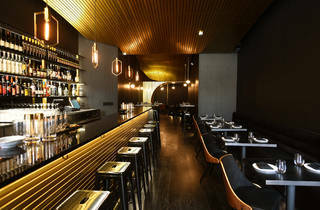 Hulking golden slats dangle over the bar area where dates convene and friends huddle waiting for tables. 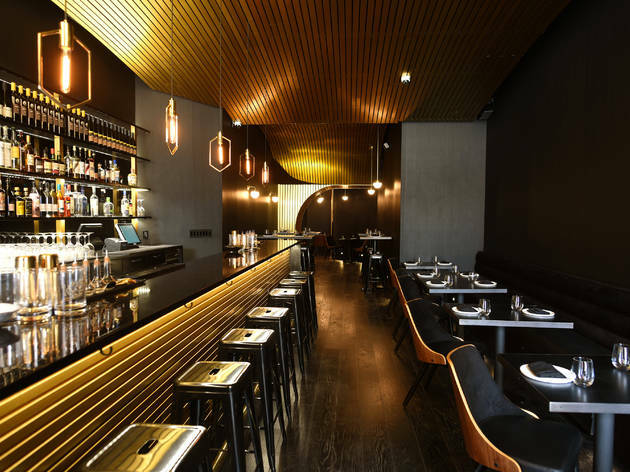 Even though the space, awkwardly narrow with stark decor (black walls, black tables, black chairs) seems a little too sterile to be totally enchanting, everything else about aRoqa casts a spell. ORDER THIS: The brainy cocktail list is full of pleasant surprises from head mixologist Stephen Thomas (Il Buco, Il Buco Alimentari). 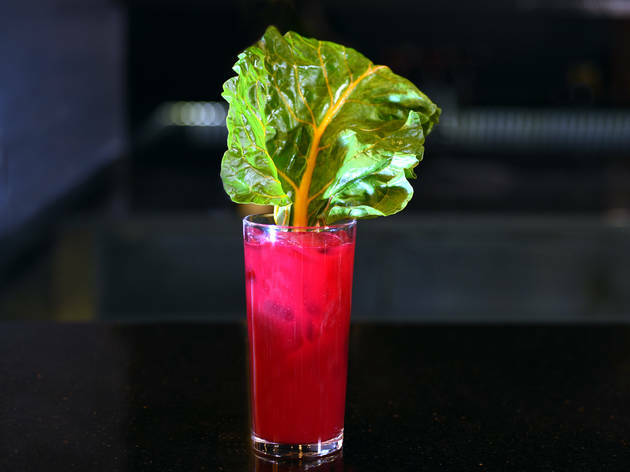 The creamy In the Garden ($14) is laced with cachaça and earthy ingredients that taste like they were plucked straight from an upstate plot, with a noodly rhubarb shaving immersed in the English-pea puree and saffron mix. 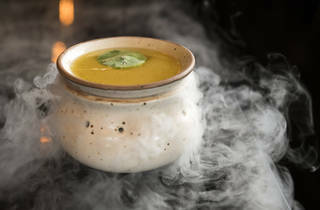 Shadowplay ($12) arrives in a ceramic bowl with dry-ice smoke emitting from the bowl’s hole-punched sides; the mescal-based elixir is sweetened with clementine and cactus water for a fruity-smoky finish. 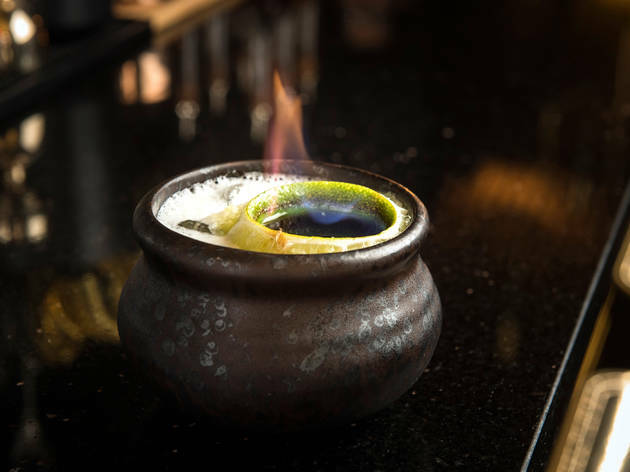 Through My Sails ($14) is another showstopper, with a shot of flaming lemon rum inside a carved-out lime rind that floats atop a foamy tiki drink with pineapple-lemongrass puree and almond milk. GOOD FOR: A date you’re dreading. If you’re struggling for conversation, the dramatic presentation of drinks and dishes will give you plenty to talk about. 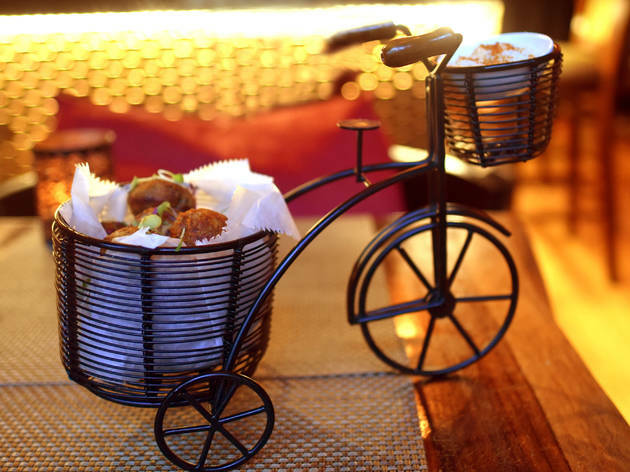 Whether it’s corn rice cakes nestled in an adorable minibicycle or grilled chicken bits flambéed right at the table, the playful delivery could create some sparks (ba-dum ching). THE CLINCHER: Chef Anand set out to create globally inspired Indian fare, plunging plastic pipettes of habanero aioli into chicken kebab or adding herb-raisin chutney to chicken lukhmi plated on a toy truck. 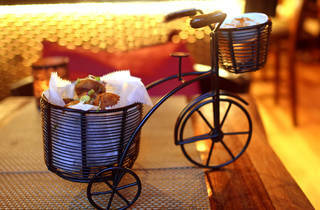 No matter where the ingredients hail from, the dishes are all done with a swish of flair and the chops to match. All the world’s a stage, or at least all of aRoqa is.